On May 17, 2013, ABC announced that Ferrera was cast in a limited-run telenovela titled Pedro & Maria, a modern-day take on Romeo and Juliet set in Washington, D.C. The series had been in development at MTV since 2010 with Ferrera serving as director on the project, which would have interactive participation online content from viewers. ABC later decided not to move forward with the series. On March 16, 2015, Ferrera was added to the cast of the upcoming NBC sitcom Superstore, portraying Amy, a 10-year veteran floor supervisor at a superstore named Cloud 9. In addition to her main role, Ferrera has co-production duties as well. The series has since been renewed for a fourth season. In 2018, her edited anthology of stories, American Like Me: Reflections on Life Between Cultures, was published by Gallery Publishing Group. ^ Berkshire, Geoff (June 3, 2016). 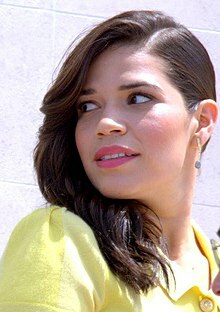 "America Ferrera Recalls 'Ugly Betty' Emmy Win, Breaking Ground for Latinas". Variety. Retrieved November 28, 2016. 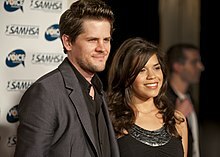 ^ "America Ferrera Praised By Congress". popsugar.com. PopSugar. January 18, 2007. Retrieved November 28, 2016. ^ "Lauréats & Nommés 2016". www.tvfestival.com. Retrieved April 19, 2017.